Darts is a game where everyone can enjoy and play. It is excellent for parties and hangouts. Although it can be a hassle to keep everything in check when all you want to do is have fun. That’s where the best electronic dart boards come in. Have a better time having one of these bad boys around. There’s no need to take note of anything as it does it for you. Ready to get something that’ll make your hang out more fun? 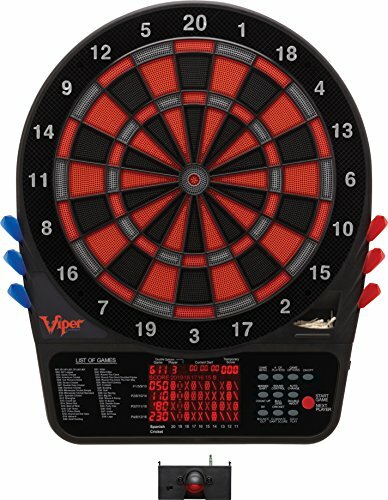 Here is our list of the Top 10 best electronic dart boards that will help you find out which is right for you. This board has an outer diameter of 16.5″ and an inner diameter of 13.8″. It provides an outer ring that will catch missed darts. 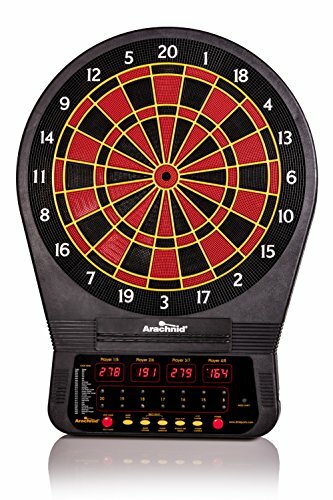 With a bright LCD, this dartboard has 21 exciting games that have 65 variations. It can accommodate eight players. It has an Ultrathin spider, wide catching ring that reduces the number of bounce outs. It also serves as a protection for your wall from errant throws. Included in this product is six soft tips, 40 tips, a quality approved adapter and game manual. However, take note that the tips sold along with this product vary, so the tips’ qualities can differ. It is recommended to get replacements. The product also includes a ‘voice in’ feature, meaning it can announce everyone’s scores. 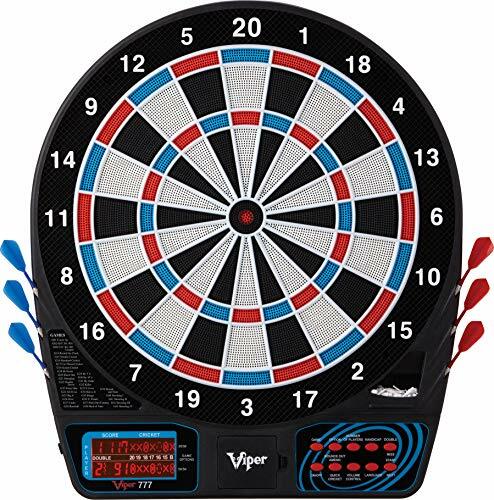 This is also good for learning how to play darts officially, as wrong throws make the tips bounce off the board, making anyone who plays throw the dart properly. Comes with 21 games with 65 variations. The tips sold along with product vary from unit to unit. This board has 39 games with 179 variations. It has NylonTough Segments that improves durability and playability and Micro-Thin segment dividers that dramatically reduce bounce-outs. It can be played to up to 8 players. It also has a lot of features that will make playing it more fun and easy. The LED screen is also easy to read, and the board itself is easy to set up. 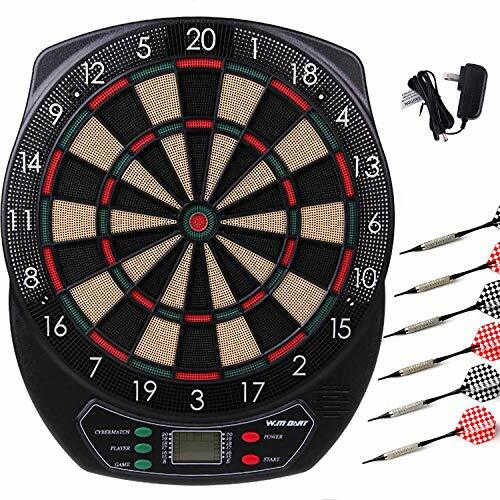 The darts you get from this board is durable, so you don’t have to worry about buying new ones. There is also a heckler feature that will prove to be rather entertaining. However, the product itself has a lot of flaws. In the outer ring, many holes are not punched out and are closed. Meaning, when you throw the dart, the tip will break, because it hits a wall. The games are also a challenge to play as there are five settings and on the lowest one it never lets you win. The unit has a lot of features. It’s LED screen is easy to read. The board is easy to set up. The board itself is easy to break. The games are very hard. 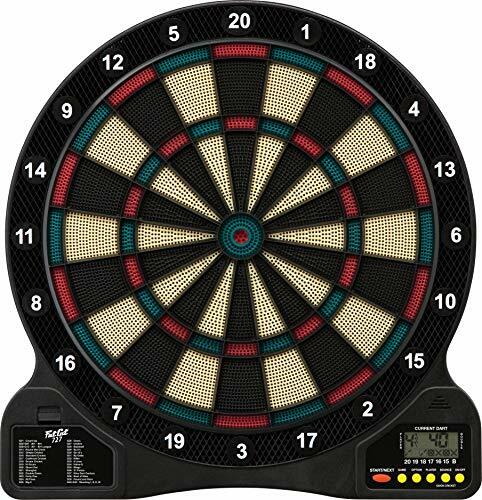 This board has a 13″ target face, and a missed darts catch ring around it just in case you miss your target. It has 18 built-in games that have 96 variations. It also includes six soft tip darts inside. The board requires 3 AA batteries to operate. It is easy to hang on the wall and plays well. The darts stick well to the board and does not bounce off like other plastic ones, but they bend, so it’s recommended to buy your darts. The board itself isn’t too durable, the battery slots aren’t too secure, so the batteries may end up falling off sometimes. Also, the darts bounce off the board a lot. The customer service is nice though, so asking for a replacement isn’t going to be hard. Has a missed darts catch ring for missed darts. It is easy to set up and hang up on the wall. The board is easy to use. The instructions are also easy to understand. The board is easy to break. The display is rather small and hard to see from the line. The battery slots on the board aren’t secure. The darts bounce off the board a lot. 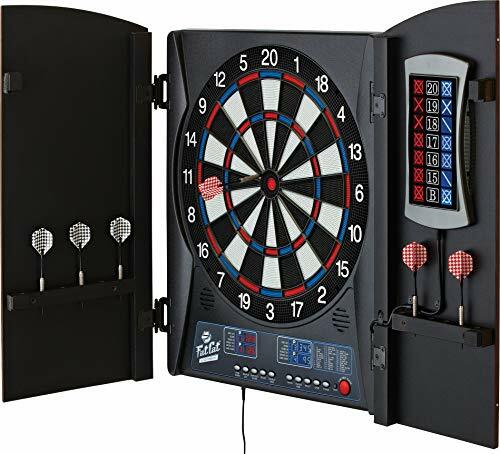 Not only does this Electronic Dart Board look nice, but it is also equipped with 34 games and 183 scoring options, there are five skill levels that you can play with, and it can accommodate up to 8 players. It has concave segment holes and ultrathin spider that helps prevent bounce outs. It has an easy-to-read control panel. It also has an LCD front display and extra large LCD cricket scoreboard inside the door. The unit comes with six darts, six additional tips, an AC power adapter, mounting hardware, and a game manual. Keep in mind that the board isn’t battery operated and has no battery slots. The board itself is made out of plastic and wood. It’s pretty durable as well. The darts, however, is easy to break and bend. There may also be issues with its sound programming, and the build of the board isn’t always in good quality. Also, its instructions are confusing and no good. Has a lot of different functions for your needs. The board design is good. The darts are easy to break and bend. There are a couple of issues with its sound programming. The quality of the board is bad. The instructions that come with the board is confusing. 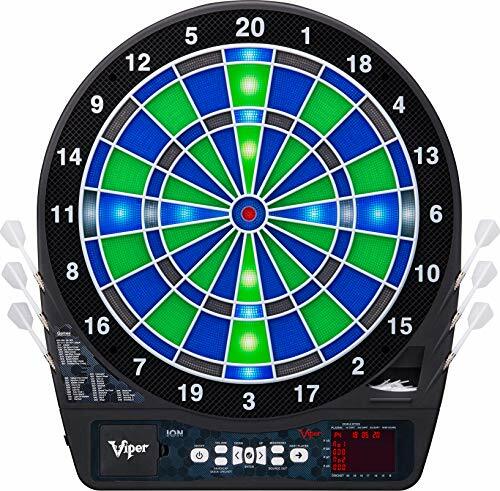 This electronic dartboard is designed with a regulation sized 15.5″ target face. It provides Tournament quality thermal resin segments that give exceptionally durable playing surface. It also has Ultra-thin spider dramatically reduces bounce outs, allowing for closer dart groupings to maximize scoring. You can change the settings to get a Bilingual voice option, it is either configured for English and Spanish. The board also features 43 games with up to 320 options and can accommodate up to 8 players. There is also a large missed dart catch ring that offers protection for your wall from errant throws. The board has an LCD that delivers a crisp, clear view of scoring and statistics, eliminating manual scorekeeping. It includes six soft tip starter darts and mounting hardware. The board Requires 3 AA batteries or the use of an external power supply adapter to operate (adaptor is not included). The darts, however, aren’t that easy to pull out- and once you do, the scoring gets all mixed up. There are also some issues with the LCD. It also can’t be muted- so if you’re the quiet type, the board isn’t recommended. The board isn’t easy to hang up, and it might fall off if it isn’t set up properly. Has a bilingual voice option. Has a large missed dart catch ring. The darts aren’t easy to pull out. There are issues with the LCD. The device cannot be muted. The board isn’t easy to set up. This board is designed with a regulation sized 15.5 inches target face and commercial-grade nylon segments. It has an Ultrathin spider that greatly reduces bounce outs, allowing for closer dart groupings to maximize scoring. It has built-in storage that can hold two sets of darts. It features 57 games with 307 options and can accommodate up to 16 players. There is also a large missed dart catch ring for missed darts. The unit includes a built-in wood cabinet, six soft tip starter darts, mounting hardware, and an external power supply adapter (5V, 1000 mA), replacing the need to use batteries. The instructions manual that comes with the product is easy to understand. You can also configure the settings to different sound levels. The aesthetic of the board is nice but, whoever assembled it, put it together wrong as the doors were on backward. The darts are also built using cheap material, so it breaks and bends easily, it’s recommended to buy your own set. Has a lot of games and features. The board design is good and aesthetically pleasing. The darts are easily broken. 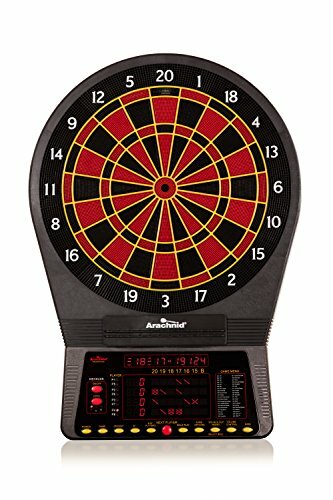 This electronic dartboard has 24 games with 132 variations. It has NylonTough segments that improve durability and playability, it also has Micro-Thin segment divides that helps reduce bounce-outs whenever you’re playing. It can accommodate up to 8 players and has Tricolor Cricket LED Displays. The board comes with an AC Adaptor, and you cannot use batteries with this unit. It’s a rather thick board, braces well against dart throws, and there are very few bounce outs with 16gram or bigger darts. However, the darts are very hard to pull out. It’s a great board for those who are just starting out. The darts that come with the board is rather cheap, it’s easy to break, and the tips tend to fall off. There are also some issues with sound. The sound programming is also occasionally faulty. Occasional problems during shipping, the product does not include everything it said it would. Comes with an AC Adaptor for charging. The Display is easy to see. Uses Tricolor Cricket LED Displays. There are some issues with sound. The darts that come with the unit is easily broken. Darts are hard to pull out of the board. This board features 57 games with 307 options and accommodates up to 16 players. There’s a bright LCD that delivers a crisp. It gives a clear view of scoring and statistics- eliminating manual scorekeeping. It includes the Viper LaserLite, a state-of-the-art laser beam which accurately marks your throw/toe line, offering an alternative to traditional adhesive floor markers. It’s a great middle-range board for those who know how to play but isn’t quite that good yet. The customer service is also pretty good, so you don’t have to worry about asking for a new unit if it arrives broken. The AC Adaptor that comes with the product can occasionally be faulty. The darts that come with it is made out of cheap material and can break easily. It’s recommended to buy your own set. However, this might be an issue of how you handle the darts. 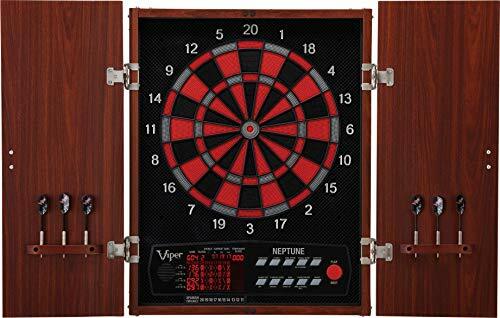 The board is made out of plastic if you don’t remove the darts in time the next players turn starts and will register points from that spot. The cover at the bottom that displays the different games and their numbers as well as the buttons to select how many players, power button, etc… is coming off. It’s very cheaply made. Has a lot of built-in features. The unit includes Viper LaserLite. The overall board quality isn’t good. This board has 48 games included that has 315 variations for tons of ways to play. It also includes 17 exclusive light-based games with moving target games. It can withstand the toughest throws again and again. 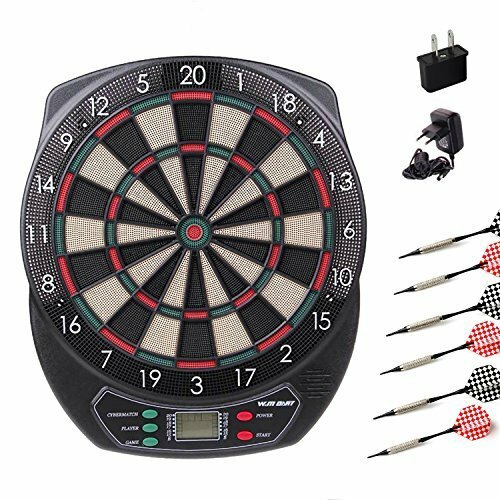 It can be played up to 8 players and includes six starter darts, extra tips, game instruction manual, and mounting instructions. It can be operated by both batteries and by the use of an optional AC adapter. The problem with electronic this electronic dartboard is that LCD is very small, and is difficult to read from the throwing line. However, the unique LED backlights attached to the board addresses the problem by lighting up the parts that need to be hit. And it also adds some fun light-based games as well. However, the dart tips are fragile and stick unto the board when the dart is pulled out. Also, the overall quality of the board isn’t so good. Is very innovative and has a lot of games. Comes with an AC Adaptor. You have the choice to use batteries instead of plugging it. The dart tips are fragile. The score display is small.